(Newser) – Offering free hugs to strangers is not cool with Saudi Arabia's religious police. 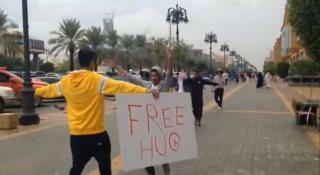 Earlier this week, a young Saudi man named Bandr al-Swed posted a video to YouTube in which he walked through the streets of Riyadh with a "Free Hugs" sign, giving them out happily to men who passed by. Al-Swed had seen the Free Hugs Campaign in other countries and "thought it could bring happiness to Saudi Arabia," he told al-Arabiya. I've seen these people in NYC; I always thought that they were trying to pick people's pockets. Although there is no evidence that they tried to rob anyone, cops arrest them anyway, perhaps for unlawful assembly, blocking the sidewalk or something. I guess it's a very anarchic, anti-establishment kind of thing to do but I always think is a cover for some kind of larceny.